I’ve struggled with decisiveness in my life. As a Perceiver (Myers-Briggs/Kiersey type), I can see the pros of multiple points of view and am hesistant to commit to any course of action. I can also see cons very easily. And the more important the decision, the more I analyze and struggle. My career choices have been no exception. 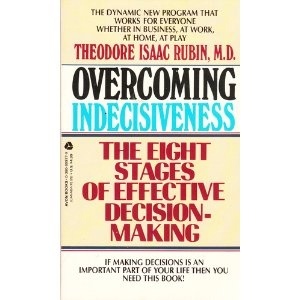 A book I read recently that helped me a great deal is called Overcoming Indecisiveness. The biggest nugget I took away from this book is that very few options in a situation are truly bad. And the decision itself is NOT the most important part of the process. Stop for just a second. Do you see how radical that idea is? The decision itself is NOT the most important part of the process? What path you choose is not the key? This really conflicts with what you might hear on a daily basis. We’re taught to analyze, break it down, get focus groups together, pray, meditate…all of this, and the decision itself is not the most important factor? As it turns out, according to Rubin, the key element in a decision is how you support the decision. What truly matters is what work you do and what planning you do to make sure that decision becomes the right one. This is an amazing concept. YOU have the power to make the decision be right by supporting it. The idea is very powering to someone who fears making a wrong move. Don’t worry about the choice – focus on supporting the choice you make and get excited about where it will take you. This entry was posted in Career Change and tagged Career, career change, deciding on career, Decision making, indecisiveness, Myers-Briggs Type Indicator, Personality, Personality type, Psychology by austinhealthychef. Bookmark the permalink.